UPDATED: Hawaiʻi Island police have located Robert McNabb who was reported missing, (October 5). He was found in good condition earlier today (October 9). 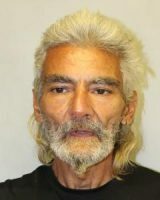 Police are searching for a 65-year-old man Robert R. McNabb who was last seen in the Hilo area on Thursday (Oct 5). McNabb is part Hawaiian, 5’10” tall, about 145 pounds, grey shoulder length hair, brown eyes and a tan complexion. McNabb was last seen wearing black colored jean pants and a black short sleeve shirt carrying a backpack. He lives in Honokaa. Police ask anyone with information on his whereabouts to call to call Detective Kayne Kelii at (808) 961-2378 or the Police Department’s non-emergency line at (808) 935-3311.